Made famous by the iconic song of The Eagles, the hotel enjoys the benefit of urban legend but is, in fact, completely unrelated to the band or the song. More about that later. Guests may select any of 11 uniquely appointed rooms or suites individually decorated with furniture from throughout the world. Relax around the tranquil pool and enjoy breathtaking sunset views over the Pacific ocean. The La Coronela Restaurant and Bar offers an unconventional menu featuring exotic dishes as well as classic favorites. On weekends you can dance the night away at the terrace bar with sounds from a variety of local bands and artists. A visit to the hotel truly offers an experience rather than a place to stay. During the mid 1990’s, a rumor began that the classic rock band The Eagles wrote their legendary hit song “Hotel California” while visiting the inn. Although completely false, the gossip spread and the hotel gained popular notoriety. 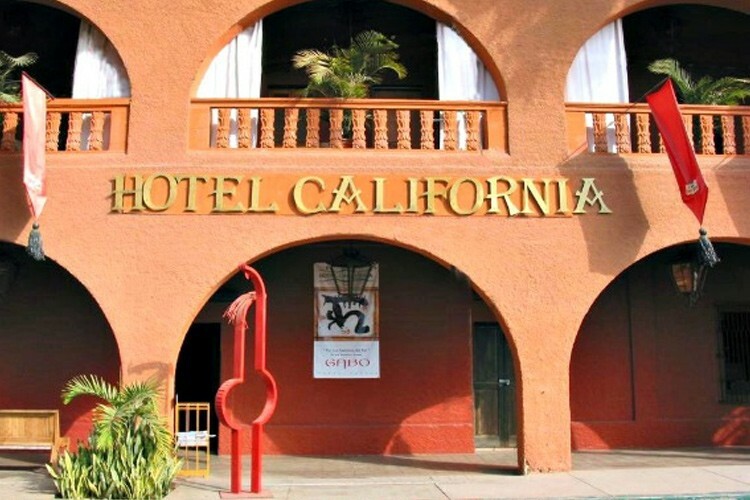 Despite any true connection, each year hundreds of tourists visit Todos Santos to have their photo taken in front of this classic hotel and perpetuate the legend even further into the future. A Mexican slang term for “joint” or Marijuana cigarette. See correspondence from Don Henley shown adjacent to this article. (Courtesy of Todos Santos pages at hotelchatter.com) In fact, the song is unrelated to a hotel at all but rather the dark underbelly of success in the record business and excess in America.